Search for Madame Roland in CBW. Find Madame Roland on the Pop Chart. William Russell’s short biography of Madame Roland begins with a nightmare parade of the Terror that followed the French Revolution, in which Madame Roland stands out as “one white-robed figure in the doleful procession, with pale, bright, classic face, mantled with dark silken hair, and illumined by deep blue, transparent eyes, kindled to indignant flame by the hootings and curses of the multitude” (that is, a scenario that blends “light into darkness,” the heroine’s appearance, and a lady’s confrontation of the mob). This heroine’s sacrifice collapses into that of Marie Antoinette: the image “dwells in the gazer's memory long after it has disappeared from the scaffold still wet with the blood of a queen, and been flung, as carrion, into the common fosse at Glamart” (R 39). Wilmot-Buxton, too, interlinks Marie-Jeanne or Manon Philipon Roland and Marie Antoinette, the subject of her preceding chapter: “life-stories…so unlike…so absolutely opposed politically, become curiously intermingled…and in the end are merged into the same common fate” (WB 137). The horrors of the Revolution stain the image of Madame Roland’s heroism, as they curdle Russell’s prose: her “clear conscience” largely seems to shine in “an atmosphere of light and purity” because of the “the contrastive foil afforded by [her] grimed, blood-spotted companions”; her “courage, energy, devotion” and “cruel and untimely death…excite the unbounded sympathy and compassion of all” who consider that she was led astray by “sinister influences surrounding her youth, and the false lights” that she later followed into “an impassable abyss” (R 39-40). Russell illustrates the bad tone of Catholic practice as well as bohemian irreverence in society of France at that period. He describes a mock catechism of the little girl by an artist in her father’s studio, and an incident when the girl took a translation of Plutarch to church during Lent: “To her girlish, undisciplined apprehension, the heroes of the classic biographer were incarnations of the loftiest attributes of humanity; the despotic democracies which they championed, communities of freemen—model republics!” This love of classical ideals shows that “this young person” could not have felt “true reverence” for the far different ethos of “the religion of humility and compassion, which teaches, in precise opposition to the Greek and Roman morality, that meekness, not pride—mercy, not vengeance…” (R 43). Wilmot-Buxton, who places discussion of Manon’s reading after the episode of illness that we turn to next, regards Plutarch as a high point of the girl’s avid reading rather than a corrupting influence: “This book, with its series of noble lives, its vivid pictures of Greece and Rome, not only opened a new world to the little maiden; it made her a Republican” (WB 140). Wilmot-Buxton is less the advocate of Christian moral progress, and cuts quickly to the anecdote that Russell in due course relates as well: an illness that defines character. “One of the scenes which the woman of forty, waiting for death in her wretched cell, remembered most clearly was an early contest of will between her father and herself” (WB 138). “Whilst her brain was still throbbing with the fresh enthusiasm kindled by the magic pages of Plutarch, an illness, requiring to be promptly dealt with, attacked her, and she was ordered to take some extremely nauseous medicine: she refused to do so, and twice her father, in spite of Madame Philipon's remonstrances, severely whipped her” (R 43). Wilmot-Buxton presents a scene in which Manon is trying to swallow the smelly dose when her father flies into a rage at her “obstinacy” and whips her. When Manon “hardened herself and declared amidst sobs and tears that she would try no more to swallow it,” the father whipped her the second time. It was the threat of a third whipping that roused the Spartan spirit, in both versions: “As the threat left M. Philipon's lips, the resolution of the imitative Spartan girl was taken; her cries and tears ceased instantly, and turning towards her father, with a look of calm disdain, she deliberately repeated her refusal to swallow the medicine, lifted her clothes with her own hand, and invited him to fulfil his threat! Madame Philipon now resolutely interposed…” (R 43). Russell’s version ends in a reconciliation of the nurturing mother and docile six-year-old patient. Wilmot-Buxton concludes with direct quotation of the common source, Madame Roland’s own memoir: “’They might have killed me on the spot’…’without my uttering so much as a sigh; nor will it cost me more to-day to ascend the guillotine than it did then to yield to a barbarous treatment” (WB 138). In both narratives, the father rather than the child is conquered by this incident; the mother is allowed to manage the girl’s upbringing: “Madame Philipon's precepts and example must about this time have obtained a signal ascendancy” (R 44) over her daughter's mind. In both narratives, Manon becomes a devout Christian, her vocation confirmed when, as her first communion approached in 1764, she begged to be allowed to enter a convent: she spent a year as a lay boarder at the “Convent of the Congregation, a building which stood next the prison in which she was afterwards to be confined” (WB 141). A child given to religious raptures, she turned her passions in more “natural channels,” friendships with another girl pupil and a lay nun (WB 142). From the convent she went, in the following year, to live with her grandmother and aunt. For Russell, this is from the frying pan into the fire, from torrid saints’ legends to Voltaire and Rousseau, reading “by the aid whereof the Christian maiden rapidly grew—or ought I to write, shrank?—into a strong-minded jeune philosophe, with a strong tendency, helped by the unquiet spirit of the time, towards ultra-democratic theories of civil polity” (R 45). Manon recalled taking offense at the patronizing treatment of grandes dames and the familiarity of servants when she was taken on visits to great houses. A visit to Versailles “inflamed” her republicanism, her desire for “freedom and equality”; Russell exclaims: “Error! Mademoiselle Philipon! Illusion ! jeune philosophe, and of a gross and very common-place kind.” Not only were the Romans “aristocratic despots,” but someone of her rare talent should never aspire to be equal to the ordinary crowd (R 46). Both Russell and Wilmot-Buxton turn to the description of the young marriageable woman, Russell emphasizing her influence on all who beheld her, including merchants and suitors. She rejected a prosperous butcher: "What! shall I, who have lived with Plato; with all the philosophers, unite myself with a shopkeeper!" Russell compares various descriptions of Manon’s beauty, “with considerable diversity of colouring…. Lamartine says she was of tall, lithe figure, had black silken hair, blue eyes, the nose of a Greek statue, superb teeth, a beautiful smile, and a melodious voice. The pen-and-ink sketch drawn by her own hand is a curious specimen of self-painting:—‘I am five feet five inches in height, have a well-made leg, and my foot is well set on; my chest is broad and nobly decorated. My carriage is graceful, and my face has a great deal of colour, with much softness and expression. No single feature, perhaps, is strictly beautiful, but taken together could not but please. My mouth is a little wide, you may see a prettier every day, but not one with a smile more tender and engaging. My eyes are fine and well opened, and the colour of the iris is hazel; and my look is open, frank, tender, varying in expression with the emotions of the affectionate heart of which it indicates the movements, and if, serene and lofty, it sometimes astonishes, it charms much more. My hair is dark brown; my nose I used to think too full at the end, but taken with the rest, especially in profile, it is not amiss’" (R 48). Manon lost the protection and guidance of her mother, who had held the family business together. Her father brought his mistress into the home, and Manon sought some dignity and independence in the convent. Her old friend from Amiens introduced M.Roland, “a well-descended gentleman of ability, fortune, and literary tastes, who had long held the important post of Inspector of Manufactures” (R 49), who impressed Manon with his easy manners and learning, in spite of his age. Roland proposed marriage, but was discouraged by M.Philipon’s refusal to give his daughter’s hand to someone who openly disapproved of M.Philipon’s irregular living arrangement. Manon was disillusioned and embittered when M.Roland accepted this rejection and went away, but in due course he returned to the convent and urged Manon to marry him; the wedding took place in 1780; they had one daughter, Eudora. “The wedding tour of M. and Madame Roland extended to Switzerland and England, with which last-named country and its institutions Madame was upon the whole reasonably satisfied, seeing ‘that in England man at least was something’" (R 51). From Roland’s estate in Amiens, and then near Lyons (Russell and Wilmot-Buxton differ in their accounts of the estate and the political developments), and in recurrent trips to Paris, Madame Roland participated in the political changes that led to the Revolution. M. Roland was elected to the newly revived National Assembly and became Minister of the Interior, and Madame Roland actively hosted salons and wrote for the Girondists. Wilmot-Buxton follows closely the stages of the catastrophe, with excerpts from Madame Roland’s correspondence, detailing her personal conflicts with Danton—“her bête noir Danton exclaim[ed], ‘Why not invite Madame Roland to the Ministry too? Everyone knows that Roland is not alone in office’”—and Marat—“the envenomed eyes of Marat and his friends were on her with no friendly gaze,” ready to seize evidence that the Rolands were traitors to the cause against the King (WB 156). At length, on the 9th November, 1793, Madame Roland stood before Fouquier Tinville's tribunal; was not, of course, permitted to be heard, and received sentence, which, upon returning to the prison, she communicated to her fellow captives by passing her hand sharply across her throat. Early on the following morning, the still beautiful woman—she was in her thirty-ninth year only, and the peculiar character of her physiognomy reduced her apparent age by at least ten years—was bound in a cart, and slowly conveyed to execution. She was habited in a white muslin robe, her dark abundant tresses waved freely in the wind, and a smile of haughty scorn curled her finely-chiseled lips as they murmured, in reply to the hooting crowd who continued to shout "A la guillotine ! a la guillotine! "—"I am going to the guillotine; they who send me there will soon follow, and you will hoot them also." Lamarche, an old man, fettered in the same cart, was overwhelmed with terror, which Madame Roland strove vainly to dispel, and passing a tall column, on the summit of which a statue of Liberty had been placed, she exclaimed, "O Liberty, what crimes are committed in thy name!" Another expression, of much greater significance and interest, is not so well known:— "Can I have pen and paper?” she said, addressing the official who received her at the foot of the scaffold; “I would, if possible, write down the strange thoughts that are rising in my mind." The request was brutally refused, and a few moments afterwards Madame Roland had thought her last on earth! Wilmot-Buxton repeats Madame Roland’s last words about liberty. “So died the heroine of the Revolution, the representative of all that was fine and pure and good in that great movement towards liberty and the rights of Man.” Her name is “spoken of with awe and gratitude in the country which owes so much to her generous devotion, her single-hearted love, her untiring patriotism” (WB 163). From William Russell, Extraordinary Women, and Ethel Mary Wilmot-Buxton, A Book of Noble Women. Ida Ashworth Taylor, Life of Madame Roland. London: Hutchinson & Co., 1911. Ida A. Taylor's (author of Lady Jane Grey and Her Times) biography about Madame Roland, which includes several illustrations as well as a list of further authoritative sources about Madame Roland. Full-text, digital facsimile of the book linked through Internet Archive. Ida M. Tarbell, Madame Roland: A Biographical Study. New York: C. Scribner's Sons, 1896. Ida M. Tarbell's biography about Madame Roland, which covers her domestic life as well as her involvement in the French Revolution. The text includes a preface by the author, several illustrations, as well as an extensive bibliography of source materials. Full-text edition linked through Google Books. John S. C. Abbott, History of Madame Roland, with Engravings. New York: Harper & Brothers, 1850. This biography about Madame Roland, written by John Abbott, frames her history against a backdrop of the events of the French Revolution. The text includes Abbott's preface as well as several detailed engravings. Full-text edition linked through Google Books. Lydia Maria Francis Child, Memoirs of Madame de Staël: and of Madame Roland. New York: C. S. Francis and Company, 1854. Lydia M. Child's biography about Madame Roland. The volume also includes a memoir of Madame de Staël. Full-text edition linked through Google Books. Marie-Jeanne Roland, The Private Memoirs of Madame Roland. Ed. Edward Gilpin Johnson. Chicago: A.C. McClurg & Co., 1901. The memoir of Madame Roland, written by herself. Full-text edition includes an Introduction by the editor, Edward G. Johnson, as well as several illustrations. Text linked through Google Books. Mathilde Blind, Madame Roland. Boston: Roberts Brothers, 1886. 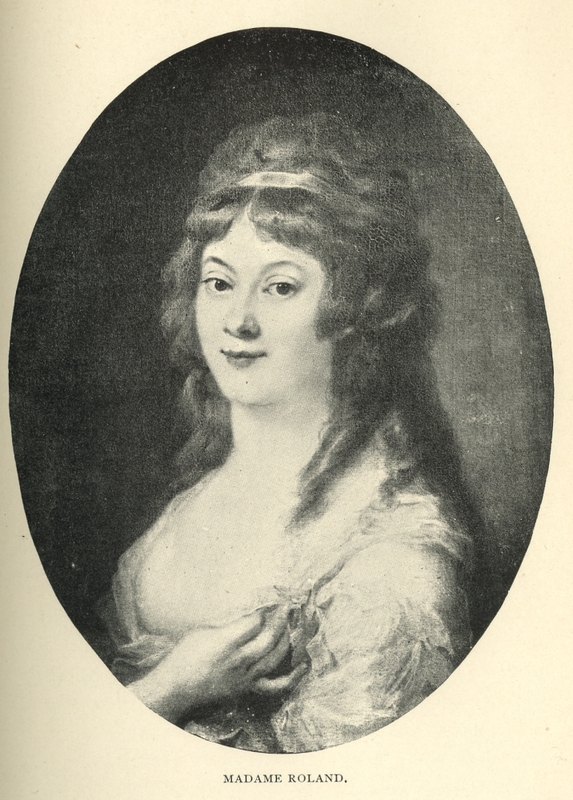 Mathilde Blind's biography about Madame Roland. This text is a volume in the Famous Women Series of biographies. Blind includes a list of further authoritative sources about Madame Roland. Full-text edition linked through Google Books.